Abstract: No more hiding in Forests, No more skulking in abandoned warehouses. He back and this time...He's got friends! Welcome to Slenderman's Army. A short horror created in less than a week for RMN's All Hallows Competition. You are a Paranormal Investigator hired to solve the Mystery of Slanciata Manor. You arrive at the Manor to discover more than you bargained for. Your investigation gets halted as you battle for your life against the "Slender Man" an entity known to stick to shadows. Kidnapping lost travelers who dare to attempt to discover the truth about who and what he is. However, he was slowly becoming overpowered by humans who successfully managed to escape his clutches with the full 8 Pages which detailed all his tricks, and how to defeat him. He realised he needed to build himself an army. He scoured the world finding the most terrifying and dangerous monsters and entities to assist him in his battle against the human race. You play as a Paranormal Investigator, attempting to discover the secrets of Slanciata Manor. 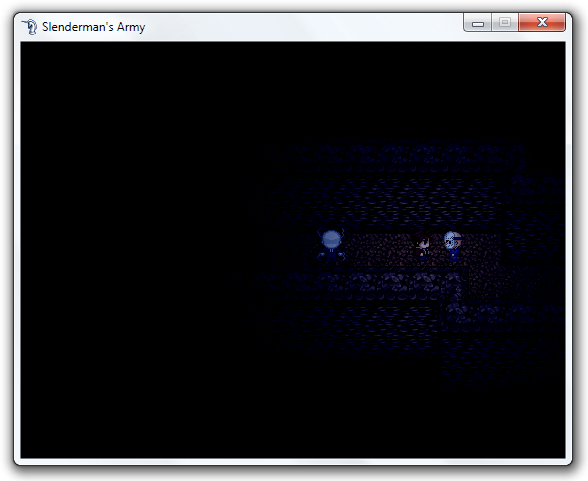 A New SlenderMan Experience: This game is unlike any other Slenderman Game experienced, due to the fact that it is 2D. A Unique Game Every Time. Each time you play it will be a new experience, things will appear when you least expect them. SFX will shock and surprise you at different times. Enemies will spawn in a number of different random places. Custom Soundtrack There is only 1 use of the RTP. The rest is fully customized, everything has been thought of. down to even the Cursor sounds. Darkness....There is a HELL of alot of darkness! I'm not a big Slenderman fan, but this looks pretty interesting. I must add it to the list of the 100's of other games I must play when I have the chance. I think I speak for both me and Shaddow when I say we're pretty damn chuffed with the Spawn System. at the hands of Slender and the other enemies. Sorry @kayden997. One thing we wanted to ensure we were able to achieve was the ability to randomize the pages, we wanted to ensure that the re-playablitiy was as high as possible. In the original Slender Game, the Pages were randomized each time you play through the game, you had some idea where they could be, but you still had to search around abit, all at the same time whilst avoiding Slenderman. So we decided to create "spawn points" for the Pages and then it could appear in a number of different places. Bug Fixes were rather difficult for us...especially with the amount of randomization we used, as sometimes bugs were only found when certain conditions were met. Overal, Slenderman's Army was a learning curve for me especially, it opened up ALOT of different ideas that sadly we could implement in Slenderman's Army that we wanted to, but due to the time limit we couldn't. For both of us it was a great achievement as it was our first publicly released game! I dunno about Shaddow but personally I am damn pleased with this little game of ours lol. We're actually looking for people to complete an LP and Review of Slenderman's Army, and are looking to see if anyone else can actually complete it. As currently I am the only one who can complete the game. All 8 pages and the secret ending unlocked. It IS possible for to complete! I've done it a few times also, to check it wasn't a sheer fluke. If you do manage to complete the game screenshot the end screen. and then PM either @Jonnie91 or @Shaddow and we'll send you the link to a reward banner, where you can COMPLETELY brag about successfully escaping Slenderman's Army! Removed Tints from rooms that still have a tint. Edit - Alright, pretty damn good. I wasn't able to get very far into the mansion, because I died, a lot, but what I saw it was amazingly well done. The darkness, the enemy spawns, beautifully brought together. I never knew a 2-d game like that could make me jump that hard. Slenderman: We have added a very small break in between him appearing and him starting to chase you to give players slightly more of a chance to escape from him. You should be able to find that he doesn't manage to kill you as quick as he has been able to so far. Door Scare: FINALLY, we have fixed the door scare for one of the later levels, you should now find that the game doesn't bug out and freeze. Sorry about that! Intro: We've fixed the bug in which you can actually cheat the game right at the beginning (not get caught). Now if you are trying to open the door still the "scare" will not activate until after you have closed the Window. Thanks again for all of your comments and new LP's of Slenderman's Army. We are really rooting to get this project pushed as far forward as possible. Is there no escape from the Faceless Man? Bad luck/ That's the last thing he needs right now! I'm so glad that it made you jump as much as we hoped. There are actually even MORE scares that have not even been shown so far! It is all very random! Thanks for your feedback, also keep your eye on SMC Games Facebook Page to ensure you get the latest updates! I made an LP of it,but not uploaded it yet. That is actually intentional although originally a bug. It has been left in due to the fact it makes it slightly harder to win. There is a way of avoiding him spawning directly on top of you, and it has something to do with what I mention at the beginning of the game. Don't Sprint. Feel free to send me a link to your LP when your done, or post it here. Thanks for playing Slenderman's Army. The latest updates include Slenderman's Library. This is a small taste into what's to come in the extension "Mirrors of Slanciata". You saw a few of the maps in the previous update but here's is a couple more from Slenderman's Library. Storyline: You guys told us that the storyline for Slenderman's Army was rather terrible. So for the new update. We're adding in an improved story explaining more about what's going on at Slanciata Manor. Inventory: You will have access to a new inventory system, Use items to find the Mirror Shards and escape. New Antagonist: Slender takes a back seat, as you continue to discover WHY Slender chose Slanciata Manor as the base for his Army. I'm okay with the game being that dark, but maybe just to get a better read on the mapping and such you could give us brighter and cleaner screens? Hm? There we go....I can ALREADY see errors myself I HATE auto-tiling carpets. Location: Malaysia, As if anyone knows where that is. Is there a mirror for the v3.0 download? Indiedb keep saying the download link isn't available or something. Don't worry Jonnie, I still like you. Although, yea, the mapping is mostly good but it can use a bit of work. Like those messed up porch tiles. Can you upload it to mediafire or Mega? The porch tiles aren't messed up in game, the parallax fixes it XD I worked for like an hour on that map....stupid parallax taking so much time. The maps are so dark, i can't really see where im going (and got stuck halfway) haha but the game is enjoyable and i play it with my lights on. For users who can't see the maps, there is a flashlight for you to find, before heading deeper into the game. There are three flashlight batteries that you also need to find,without them unfortunately it does get rather difficult! When things break... it's usually my fault. Location: Onett, pretty much the same as North Texas. Even though no one has posted here or maybe even not downloaded this game for a while, I downloaded it a while ago, and absolutely loved it! I loved the concept, the story, everything! I just wish the real Slender was like this... CREATION TIME! There's only one bug I found, and that is the first note can spawn in an inaccessible location. I didn't get a screenshot early enough, Slenderman spawned on top of me Anyway, I really want to see more from you. Nice work! Huh, thought I squashed that bug a while ago, I'll look into it. Thanks for the positive vote and the pointing of the bug. By the way, we are working on an expansion, I hope you will play it. Also, I've updated the download again (cause I'm an idiot and didn't recognize that there was a GIANT transfer Error! Just watched DP3's review. Too much laughing + my bruised ribs was pretty painful, but I couldn't stop. Too funny.